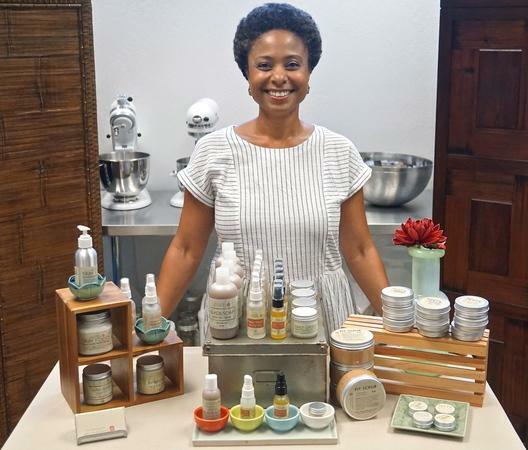 This week, I had the pleasure of interviewing Nubian Flunder, founder & CEO of The Healing Place Apothecary, an Oakland-based provider of plant-based skin and hair care products that are handmade with premium natural ingredients. Nubian’s products draw on her 20+ years of experience as an herbalist, holistic educator, and acupuncturist, and are steeped in holistic principles from Asia, Africa, and the Americas. In this interview, Nubian shares how she’s created a business on holistic principles. What inspired you to start The Healing Place Apothecary? I initially became interested in Traditional Chinese Medicine because I was a martial artist for a good chunk of my life. I have a brown belt. But, I injured my knee. As part of the physical therapy, I used acupuncture. My knee healed so fast. I was intrigued by the whole process. So, when it was time for me to think about graduate school, I decided to study Traditional Chinese Medicine. From there, I started a private practice as an acupuncturist and professional herbalist. The Healing Place Apothecary was born out of my private practice. I have specialty in treating skin disorders, like eczema, psoriasis, and various other types of skin maladies. I was having tremendous success with treating patients with Traditional Chinese Medicine both internally and through topical solutions I created for them. Patients began sharing the topical solutions with their friends and family. So, I began to manufacture these products for my clientele. When I became a mother in 2010, my ability to work 40-60 hours per week shifted. I was looking for an opportunity to work from home a little bit more. So, I decided to take my formulations and create a line – a simple product line that I could sell locally and online. It started out with just a couple of products to provide a way for me to stay home with my baby. When you came into our accelerator, I remember you telling me that every time your sales started going sideways, you would create a new product. How did that affect your business? I’m definitely a creative at heart. I can learn pretty quickly. And, I like to make things. So, I would see something or I would use a product, and would think I can make that or I can make that better. While it’s necessary to keep an eye on other players in the market, I learned over time that it’s important to stay true to your niche, your brand, and your brand story. And not always trying to take on what other people have found to be successful. But back then, if things got slow, I would look around and see what other people were doing and think that I needed to do that. I need to add that product or do that thing. And, it wasn’t a good idea for many reasons. One of the main things that I learned is that when you’re developing products, it’s better to branch out on what you already have, so you don’t need a bunch of new materials. Look at the materials you’re already using if you’re going to develop a new product. If you can create the new product from 80-90% the materials you’re already using, then it’s feasible. But, if you need to get a whole heap of new ingredients or new processes to make that new product, it’s just not cost effective. Also, I think it’s confusing to the customer. Particularly with direct sales, less is more. If you have three items for sale and you’re at a big show, you want everyone to leave with one of your three items. If you have twenty items, people may leave with nothing because they are overwhelmed with too many choices. So, now you’ve honed in on your products? Yes, I have honed in on my products. I still have to really force myself not to create new things all the time. Because I love the things. I have a library of products that are shelved and archived that I may or may not come out with at some later time. But, I pretty much have my line down at this point. My line has three components – natural skin care, hair care and deodorant. The skin care includes bath, body, and face care products. I have some liquid soaps and body scrubs. And, for face care, I have products for oily, dry, and combination skin. For hair care, I have only three products, focusing on moisture. My natural deodorant is one of my bestsellers. It’s paired with a deodorizing scrub. The deodorant gives about eight hours of protection before you need to reapply, if at all depending on your body chemistry. All my products come in travel sizes, so if people can try them before buying a full package. And, then I have several ways to combine products in groups in case a customer says they don’t know what to get. They can get a gift set or a combination set to get them started. How did you figure out how to hone down your products? Well, my mentor at Uptima kept telling me that I had too many products. I was very resistant at first because I was comparing myself to more established lines that have the resources and staffing to manage all of those different products, ingredients, and inventory in a way that I was not ready to do. But through some expensive mistakes, I was able to see her point. How has narrowing down your product line changed your business? Well, it certainly has given me more confidence, especially as I started to grow my wholesale business. My well-rehearsed knowledge of each product allows me to convey information to retailers in a very confident and efficient way so that they can share it with the consumer. With too many products, even I might forget what the ingredients are. It’s also helped me financially in terms of having more structure around my planning. If I’m interested in creating a new product or partnership, I have a structure to look at whether it’s cost effective. So, I’m not making emotional choices. My choices are backed by numbers and research. I can confidently say yes or no to an opportunity, and not act out of desperation. That confidence is really important. When you’re not confident somebody might come along with a seemingly exciting opportunity for you, but if you’re not ready or you don’t have the confidence to know if it’s going to be viable, you can make a lot of expensive mistakes. You mentioned that you are getting into wholesale accounts. This is a transition from how you started selling at local shows and online through Etsy. What have you learned in this transition? As a consumer products manufacturer, wholesale and retail are two different machines. With wholesale, I have a more personal relationship with one person at the retail location, whereas with retail, I have this same personal relationship with hundreds of consumers. Because I focus on wholesale to other small businesses, it’s about partnering with and empowering other entrepreneurs – if my business is successful, then their business is successful, and vice versa. It’s really important to have good communication, ensure quality control and timely delivery, and make sure the packaging is ready for the shelf. What has been your biggest challenge in this business? The thing I’ve struggled with the most is using myself as a marketing tool. I think I have a very marketable story. But, I’m just not comfortable being out there like that. I grew up in a very public family, and I just was forced as a child to be in front, to be upfront, to smile, to always be on. And, as an adult, I don’t like it. It’s a very uncomfortable space for me, to promote myself. And, even though I have an outgoing presentation, I’m actually pretty introverted and private. This came up in a big way when you did crowdfunding. How did you get through it? Oh yes! I did crowdfunding three times. There was the Whole Foods Small Producer Grant where I had to ask people to vote on me so I could be selected for the grant. Then, I did an Indiegogo campaign. And nine months later, I did a Kiva campaign. All of these had components where I had to reach out to my network and tell people. It was hard. I had to be in a video. I hated doing the video. I had to take pictures. And call people. Ugh. I didn’t like it. But, I did it. Just because I don’t like something doesn’t mean I don’t do it. It just had to be done, so I did it. When you’re an entrepreneur, you work for yourself. There’s nobody to report to. There’s nobody to light a fire under your behind. It’s you. You’re it. You might have some colleagues in a cohort like Uptima to hold you accountable. But, a lot of times, it’s you. And, you just have to keep at it. You went on to win a Whole Foods Small Producer Grant. How did that feel? It felt good. People still think I’m in Whole Foods. They ask which Whole Foods I’m in. I didn’t end up getting my products into Whole Foods after the grant competition. And, I’m glad I didn’t, because I wasn’t ready at the time. I learned a lot from the process. It got the name out there and built some brand awareness. You turned around right after that and ran an Indiegogo campaign. How was that experience? This is another example of how I learned to incorporate my holistic principles into my business. I ran the campaign in the fall. I learned that the fall and winter are not good times for me to do fundraising because we’re just energetically moving into more of hibernation period and it’s the beginning of the holiday retail season. People are just in a different space. And as someone who makes a product that could be a good gift item, I’m doing a lot of events and sales are really picking up around that time of year. There’s a lot to do around shifting marketing, website, and search engine optimization to support the holiday sales. So, I learned that spring and summer are just more vibrant times for me to generate funding. I also found that the Indiegogo model didn’t work well for my type of business and stage of business. But, if you decide to do crowdfunding, I suggest that you be extremely organized, be able to carve out some space to take time off to just focus on the crowdfunding, and try to get some upfront capital so you can maintain the operations of your business while you take the time off. You really want the campaign to be structured and make sure it’s at a time of the year that you can really focus on it. And realize that once the campaign is over, you have to fulfill all the rewards on top of whatever new business you’ve generated from the constant marketing of the campaign. There’s a lot of following up even after the campaign ends. So, you learned from that and ran a Kiva campaign. How was that different? It was the next summer. I ran a Kiva campaign, which was very successful. There was a lot I learned from marketing the other two campaigns. But also, the biggest difference was it is a loan. That shifted how I interacted with people and how I made my ask because they were lending me money rather than giving me money. I think they felt more confident that they are investing in my business. When I’m saying “I have this business, I’d love for you to invest by lending me $X and I’ll pay you back over a certain period of time with no interest,” it’s better than asking for some cash in exchange for a thank you gift. Kiva was a better platform for me. The only downside was the cap on how much I could raise. What’s the most fun thing for you in this business? The most fun thing is seeing the customers return and gloat about how their life has changed in some way because of my products. Like they used to have horrible skin or they never thought that scar was going to go way or look at my shiny hair. It confirms that the product is not just good in terms of natural ingredients, but it’s working and they are benefitting from it. That keeps me going. And then the other positive thing is that I’m still around. I beat myself up a lot, but the fact is that most businesses fail by the time they are where I am and I’m still kicking and screaming and pulling at it. With this business, I’ve been able to make a life for myself and my kid and invest in my family. Branding overhaul. And more support for the wholesale branch of my business. I’d like to be in at least one retail store in every state. In order to really scale up in that way, there are some things that I need to fine tune with the way that I approach wholesale customers. What tips do you have or advice do you have for someone who is looking to start or grow their small business? The first tip is that you need Uptima Business Bootcamp. If you are thinking about starting a business, I suggest taking at least the first module of Uptima to really find out if you have a viable business proposition. Really go through the grueling work of peeling back the layers to see if you can take this great, fantastic idea that’s in your head and put all the pieces in place to make it that happen. And get your business skills sharpened. A lot of folks can cook, but it doesn’t mean you can run a restaurant. Just because you’re good at something doesn’t mean you can run a business out of it. There’s a lot of things that go into that. So, I highly suggest you get some business mentorship and learn some business fundamentals, both general business fundamentals and also specific to your industry. Commit to try not to make horribly expensive mistakes. Ask people. Find out. Don’t just walk out into the middle of the street if you don’t have to. Find out. Ask around. Do the background work. Lay a good foundation so that you can have a strong launch. Spend some significant time on your branding. I mean branding beyond your logo and website – what is your business motto, what is your mission statement, how do you embody that wherever you go. Every time you shake a hand or pass a card, what is it that you want to be conveying to the world as you’re planting seeds for your business. Really give that life and become that so that you don’t have to muster it up all the time. Take some time to really write down and brainstorm your vision for your company. Learn everything. Even if it’s not your specialty in your business or its not your strong suit, learn it anyway. Then, hire someone to do exactly what you want them to do after you’ve learned it. If you don’t learn it, you don’t really know what you want. You don’t know how to ask, and you’re going to waste a lot of money figuring it out with this other person that you hired, because you don’t know the systems. So, learn all the systems. At least be familiar with them. And, then you can say this is what I want to happen. And, prioritize your self-care. I would really write that into your business model because it is very easy to get burned out quickly if you don’t have some self-care tools that are built into the way you work. Maybe that’s once a month, you go home at 12pm or you take a nap in the afternoon. It’s your business, you can do whatever you want. But prioritize positive tools for managing your stress levels and having some fun. You can purchase natural skin care, hair care and deodorant products from The Healing Place Apothecary online or find them in these stores: Kosa Arts in Oakland, CA; True Waxology & Skincare in Walnut Creek, CA; Simply Smooth in San Ramon, CA; and Flourish Boutique in Baltimore, MD. Awesome! Thanks for the love.